Utsavams are festivals celebrated at the temples. Generally everyone enjoys festivals. But with temples there is also another reason to celebrate an utsavam. The three Murthies, Lord Siva, Lord Vishnu and Lord Brahma along with Their Devies are supposed to participate in the Brahmothsavam of Kamakshi Temple. During the procession in the Utsavam all the thirty three thousand Devatas starting with Indra and Dik Balagas are supposed to participate. Also Utsavams are celebrated mainly to ward off the various pollutions created at the temple atmosphere due to many reasons. Hence the devotees who attend the Kamakshi Temple Brahmothsavam will get their problems solved and their desires fulfilled by the presence of the Three Murthies and the Devadidevas. The deities are taken in procession accompanied by Temple elephants, Nadaswaram, Bands, Bharatha Natyam Performances, Kolattam and other local entertainments like bommalattam, (using Alis, huge dolls made of paper mache), kudiraiattam etc creating a festive atmosphere. People from different parts visit their relatives during the festival. Roadside shops sprout selling numerous articles of interest to children and elders. An Utsavam is an exciting and exhilarating function where devotion, arts and business are blended together homogenously. Hence people are happy and enjoy the festivals. Normally people go to temples for praying to get the blessings. During festivals the Gods come out to meet people and give blessings to everybody including the old and indigent who are not able to visit the temple. Brahmothsavam is a big festival, which is celebrated every year in temples. As per legend it is told that Lord Brahma started it and it is believed that during this festival he himself presides over the festival, hence the name "Brahmothsavam". It must be celebrated because during this time Yagasala (Homa guntams), Initialising the God in the Kalasam (Pot), Japa on both the times mornings & evenings, everyday Abhisheka for the Moolavar with the Kalasa Jalam (water) etc. are performed which help to purify the atmosphere. Kamakshi Temple Brahmothsavam. At Kamakshi temple the Brahmothsavam starts generally in Tamil month of 'Masi'. The important events of this Utsavam are given below. In the evening the Astra Devi (the deity representing the Angusam of Kamakshi) is taken in procession along with Lord Ganesha to the Mritheshwar Temple at North Raja Veedhi where after proper propitiation with appropriate puja Mrithsangrahanam (Removing mud) from under the Bilwa Tree of the temple is taken and brought Kamakshi Temple. This ritual shows how closely Hindu religion respects the ecology. Even removal of mud for the festival is done after paying proper respects to the gods concerned. This mud is used next day to grow Paligai (growing lentils for the Festival) at the foot of Dwijasthambam. This is a very important day when a number of activities take place. The Sivachariars (priests) who are chosen ties the Rakshabandan on the hand at a religious function where he makes the sankalpam (oath) to adhere to the rules and regulations of the rituals for conducting the Utsavam. One of the conditions is that he should not leave the town till the completion of the Brahmothsavam. In fact this is generally observed by the public at large also in the olden days. After the start of the Brahmothsavam people of the city do not go out of it during the Utsavam. Apart from this a number of Homam, Kalasa sthapanam etc are conducted within the Temple premises where reputed Vaidheekas (Veda Vidwans) participate in doing Japam, Homam etc for the general benefit of the mankind as a whole. Dwijarohanam is done on this day when a flag carrying the picture of Sri Devi Kamakshi will be hoisted on the Dwajasthambam i.e., flag mast of the Temple. It announces to everybody that the Brahmothsavam has started. During this time the Paligai is also planted in the mud taken from Mritheshwar Temple. Every day of the festival Utsava Kamakshi Devi is taken in procession both in the morning and evening accompanied by other deities like Saraswathi and Lakshmi depending on the Vahana used. The day wise list of Vahana is given below. From 4th to 9th day, Acharyal also is taken out in the evening procession. Every day Utsava Kamakshi is taken in procession in the morning and evening through all the four Rajaveedhies and Vanavedikkai (Firing of Crackers) is arranged near Kachabeswarar temple on different vahanas. But on the 5th day i.e. evening when Utsava Kamakshi is carried by Naga Vahanam (Snake) she is taken up to Gangabai Chatram beyond Sankara Matam. On 6th Day- Sri Devi Kamakshi is taken in procession on the wooden chariot and Sri Devi stays in the Sankara Matam from morning to evening. During this time all respects are paid to Sri Devi and the temple staff. On 9th day - in the morning Sri Devi is taken in procession on "Almelpallakku" which is a special palanquin sculpted with toy sevadar carrying the palanquin. In the evening Utsava Kamakshi is taken in procession on Silver Chariot donated by Sri Acharya of Kanchi Kamakoti Peetam. The Pallakkus (palanquins) are always carried by men force called Sreepathasevai which is a tradition going on for many years. On 10th day - Evening carrier is Kalpagodhyanam, which is a tree similar to Kalpaka Vriksha. This day falls on Masi Magam and devotees take bath in the Temple Tank inside the temple and this is called Theerthavari. This day Dwija Avarohanam i.e. lowering of Flag is done. After this Sivachariar removes his Rakshabandan. 11th Day - This night Utsava Kamakshi Devi is placed inside the Moolavar, the Sanctum & Sanctorum. On this 12th day of the festival Sri Devi Kamakshi gives Viswaroopa darsanam to all the public at Moolasthanam with Urchava Ambal. Cow and calf are brought to perform Go puja. The Moolava Kamakshi has Chandana Kappu (Sandal Paste) on this day. 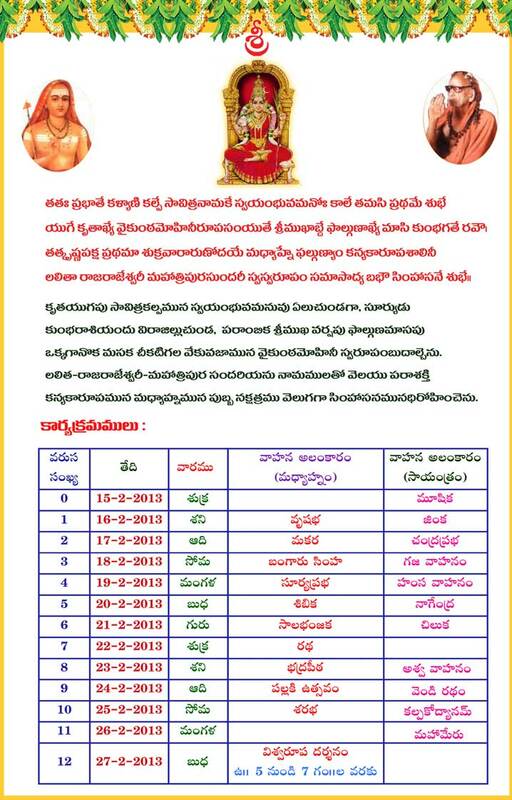 Vidaiyatri Urchavam starts from 12th day. Goddess Kamakshi will be giving Darshan in the temple premises in full attire with jewels sitting in the Unjal (swing) in the Sukhravara Mandapam in the temple. Sri Devi is supposed to be relaxing these days. This will go on for 7 days. During this time chanting of Veda and music programme using various kinds of musical instruments take place. On the 8th day of Vidaiyatri festival both Moola Kamakshi & Urchava Kamakshi have Chandana Kappu. 9th day of Vidaiyatri festival evening Utsava Kamakshi will go around inside the temple in Pushpa (flower) Pallaku. For the last 3 days Payatankanjhi Festival is performed. It will be done in the Urchava Kamakshi's place known as 'Asthanam'. Goddess Kamakshi will be giving darshan in a very relaxed manner to remove the fatigue of the busy schedule She underwent for the past 18 days. During this time green dal kheer, soaked broken green dhal and powdered jaggery along with Vada is offered to the Goddess for ushna (heat) santhi.